The week is coming to a close, and hopefully you have some time in the very near future to collapse on the couch. But when you finally get that break, you'll still be racing through the universe at astronomical speeds. Our planet is rotating around its axis at a rate of 1,000 miles per hour, and our moon is swinging around us. We race around the sun at 67,000 miles per hour, along with all the other planets, dwarf planets, asteroids, comets, and centaurs trailing along at their own pace as they make the journey around the sun. Our sun, light of our lives and the gravitational glue binding our solar system together, is itself no lazy creature, spinning at 4,400 miles per hour. The star and its twisting disc of planets make the long marathon along the outskirts of the galaxy at 43,000 miles per hour, bobbing through the galactic plane. Even our Milky Way is in a steady dash, moving at 1.3 million miles per hour with respect to the Cosmic Microwave Background Radiation. With all this running around of orbits around orbits, what does it all look like? Over on Observation Deck, B☯rg A. Chupacabras ♀ posted a gif reflecting some of this sense of endless motion, extracted from a 2012 animation by DJ Sadhu. It's pretty, mellow, hypnotizing, and distressingly unscientific. Vortexes require drag and friction. Neither happen in the vacuum of space, or impact the orbit of planets. Tracing a helix through space shares a geometric shape with a vortex, but is a reflection of entirely different physics. Saying the solar system is falling down a vortex will make astrophysics cringe, lash out violently, and/or cry themselves to sleep. Nothing is to scale. Admittedly, representing planetary sizes and orbital distances at the same distance scale is difficult to do artistically. The heliocentric model of the solar system — that the sun holds the planets in orbit with its gravitational pull — is real. We aren't tumbling through space in a randomly coordinated free-fall: the planets are bound in this solar system by the fierce, unrelenting hold of our star. The complex and successful dances we perform with the orbital mechanics of satellites is proof of that. The entire solar system travels around the galaxy, but the sun does not charge ahead leading the way. 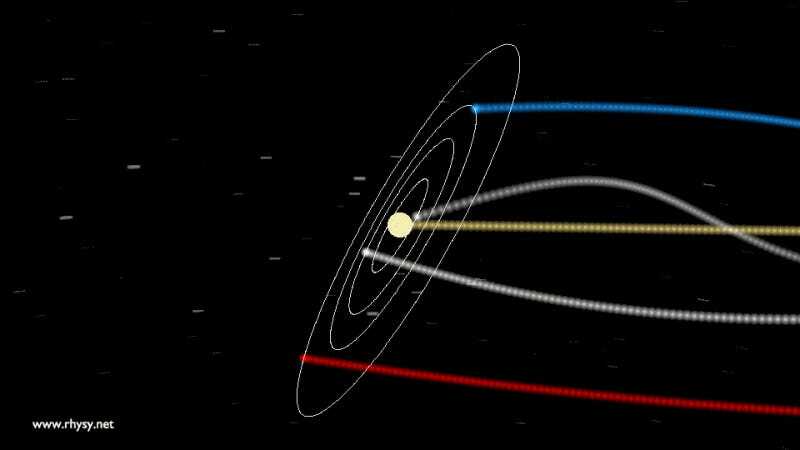 The orientation between the orbital plane and our star's direction of travel is roughly 60 degrees, not the 90 degrees portrayed in the video, so different planets lead during different points in their orbits. This still results in a helical path, but a more complicated (and I think prettier!) one. The text is just... well, it's... look, I don't have a polite way of addressing it. You can read extremely thorough analysis and debunking by astronomer Phil Plait, or astrophysicist Rhys Taylor. I already poked an anti-science group last week (...and again this week). Fine, the planetary size versus orbital distance scaling is still an issue, and this is for a simplified solar system, but it's still a step in the scientific direction. Taylor isn't just an astrophysicist, but also an artist, and created this gif of the helical paths our solar system traces as the entire disc rotates and twists. No fancy sound track or dramatic camera angles, but I think the real science makes for an even cooler visual with more complicated, twisting paths than in the viral video. And look! It's already a friendly format for you to throw down at the next GIF party. So, next time you're feeling like the week just won't end, and Friday night can't come soon enough, remember: you're hurtling through space at over a million miles an hour, and have been your whole life. Even just within the Milky Way, that's still 101,000 miles an hour you're racing around the galactic core, and you never, ever get a break. NASA has more on calculating the speed of planet Earth, the Sun, and the Milky Way; or read this special by the Astronomy Society.